There are only a few occasions when my daughter wakes me up, usually I am awake before she is. One is Christmas morning (yes, she is 31 and it still has not changed). The others are those rare times when nature does something you just can't miss. This happened last Saturday morning. Maggie's alarm woke her up, and as she rolled over to catch just a few more zzz's before skiing, something caught her eye. 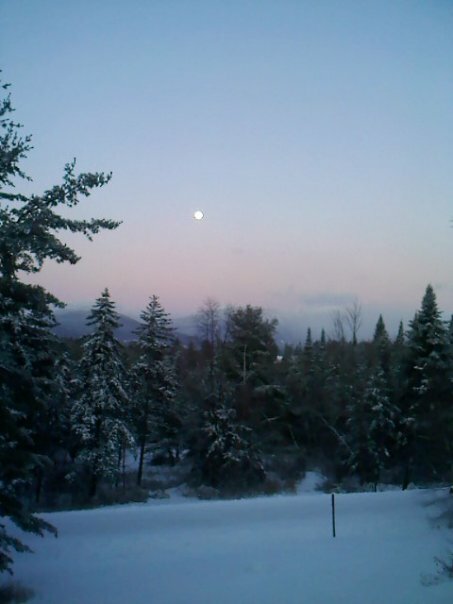 It was the moon, glowing over Mount Mansfield. It was a stunning view to behold at 7AM. After she snapped a photo with her cell phone and failed to find my camera she woke me up so I wouldn't miss it. It was -3 degrees outside on Saturday morning, but a sight like this reminds us why we live in Vermont.